This month, Natashya (Living in the Kitchen with Puppies) chose the BBBabes’ challenge. Initially, I blanched because I thought the bread was going to be filled with fresh tomatoes. All I could think of was: where on earth are we going to get decent fresh tomatoes in Toronto in April?! But of course, I should have known better. You would think that I would be familiar enough with my reading skills (and content retention) by now. It turns out that the filling choices were perfectly designed for a cold April kitchen. 6 April 2013, 07:56 I guess it’s time to get cracking on this month’s bread. I have been putting off thinking about it because of the tomatoes. Tomatoes are so watery and dull! There must be something else I could use instead. Peppers? Maybe. Mushrooms? Oooh, that’s a nice idea… I could cook them first to get rid of the liquid and maybe add a bit of thyme too to make a sort of duxelles pane bianco. I just hate the idea of putting cut up raw tomatoes into bread dough and having them get all over-stewed and watery. Ohhhhh! Duh. The tomatoes are sun-dried. (See how reading the recipe all the way through is a good idea? :lalala:) Well. That does make a difference, doesn’t it? Maybe I’ll use tomatoes after all. 12 April 2013, 22:41 Oh oh. Time is flying, isn’t it? I guess I’d better bake this bread soon. Really. I’m thinking tomorrow would be smart. I was looking through the ingredients list again and I just noticed that this bread calls for fresh basil. Fresh basil? In April? In April of this year when it snowed last night? While I know that I could buy hot-house fresh basil from the vegetable store, I’m thinking that the flavour will be better if I take some of the pesto I made last September out of the freezer. It might not be quite as green as fresh basil but it will certainly have more flavour than the faded ridiculously expensive sprigs being sold at the vegetable store. Perhaps I’m very old fashioned to expect the ingredients by grams to be in grams…. Excuse me while I get out my calculator. Let’s see now. 2.25tsp = 7 gm dry yeast and 1tsp = 6 gm salt (click click ... click click click ... click click click....) Aha. The “by weight” recipe SHOULD say 12 gm dry yeast and 12 gm salt! Granulated garlic? Garlic powder? What???? There is no way I’m using that. It will just make the bread bitter! And Italian blend cheese? What’s that supposed to be? Is King Arthur really suggesting that people buy those ridiculous bags of preshredded cheese at the supermarket? I’ll grate some quasi parmesan (I think it’s Ilha branca that we have in the fridge) and maybe add a bit of quasi mozzarella too (don’t get me started on how hard it is to find decent mozzarella). And I’ll use finely chopped fresh garlic. Whoa, Nelly!! King Arthur seems to have a different set of scales than the rest of the world. Their gram measurement is QUITE wonky! Okay. I do know I’m a freak. But I’m pretty sure that the weights given by King Arthur are off. Last time I checked, an American cup holds 240ml. And a ml of water weighs 1 gram. Yet, King Arthur Flour seems to think that an American cup holds 226gm of water! It turns out that a cup of King Arthur bread flour is a different weight than Gourmet Sleuth bread flour (137gm), which is different from Traditional Oven bread flour (127gm), which is different from Roger’s bread flour (160gm!! ), which is different from…. I’m not going to bother with the weights for the filling ingredients. I probably wouldn’t weigh them anyway. But. Is this jar of sun-dried tomatoes perhaps in fluid ounces – in a jar that holds roughly 250ml?? That’s A LOT of tomatoes. And there is no way I’m using that much sugar. Or that much yeast. And I’m going to have to add some flax seed and whole wheat flour too. Apparently, salt isn’t a common ingredient. Sheeesh! I thought King Arthur was supposed to be THE bread baking flour for Artisanal baking. You’d think they’d have it together to know that different coarseness of salt has different weights. 10:57: I weighed, mixed and kneaded the dough, using my trusty meat thermometer to ascertain that the water temperature was 90F. I decided to use powdered milk rather than heating up actual milk; it’s WAY easier. And then as I was reaching for the sugar and looking in horror at how much the recipe called for – it looks like a brioche recipe!! – I decided to halve the amount. Then, while I was opening the sugar container and picking up the spoon to scoop some out, I suddenly rebelled. I put the spoon down, closed the container, grabbed my pen and put a big horizontal slash right through sugar on the recipe. Ha! And I was on a roll. I continued my transgression by using all-purpose and whole wheat flours, ground flax seeds (Tanna’s favourite) and a little vital wheat gluten. After all, I’m not making dessert; I’m making bread to go with dinner. Kneading was easy easy easy – the dough wasn’t quite as soft as the brioche-like dough I expected. Good thing I didn’t weigh out the larger initial amount of flour I was going to use. Hmmm, I wonder if the dough is stiffer because I didn’t add the sugar. 17:51 Everything is fine. The dough rolled out beautifully. I eyeballed the amounts for the filling ingredients, using thawed pesto from the freezer, finely chopped garlic, Ilha Branca and Mozzarella. Also, because the tomatoes we bought were dry, I slathered on a little olive oil. My reading skills (or lack thereof) were displayed once again as I used a sharp knife to cut the tomatoes. Too bad too. I have the most lovely set of kitchen shears! And then it came time to shape. The “S” part was easy. But I got lost on forming a figure 8. I’m guessing that it doesn’t matter a whole lot. What I did looks pretty…. Initially, I was going to connect the halved roll to make one giant S, but then decided to go with two smaller Ss. They’re rising now. Time to turn on the oven! Did I say these were smaller Ss? Ha!! They became rather large. (The cookie sheet is about 50cm/20in long.) They look beautiful! Even if they aren’t figure 8s. 19:22 I just turned the tray. Holy cow!! What oven spring! I can NOT believe how much the bread rose in the oven. I love it when that happens but I don’t think I’ve ever had it happen so dramatically! And it smells fantastic too! Now I can’t wait until tomorrow night! We’re planning on serving it with smoked pork, baked beans, beet salad and steamed broccoli. Yes! You read that right. It looks like spring might be springing after all. T is going to fire up the barbecue tomorrow to smoke the meat. And T loved the bread. I confess that I was a little less enthusiastic. For me it was too soft – too much like cake – too reminiscent of brioche. Not that it wasn’t good. It was! And it’s so beautiful too. But I’m in Spring Cleaning mode and am moving more toward lean breads! I’d like to be able to do up the waist band buttons on my skirt. Mixing the dough In a largish bowl, cream the sugar into the butter. Stir in yoghurt and egg and beat well until the mixture is smooth. Using a wooden spoon, stir in flour and yeast. (If you are using active dry yeast, first whisk yeast into a small amount of lukewarm water to dissolve it.) It should be the consistency of a stiff batter or very wet dough. Kneading Use your hands to knead the dough in the bowl for about 5 minutes. Scrape as much of the dough off of your hands. Cover the bowl with a plate and set aside on the counter. Shaping Initially, the shaping for this bread is very similar to the one I used to make a Russian Braid: Scatter a light dusting of flour on the board. Turn the dough out and cut it in two. Fold each piece of dough in half, cover with a clean tea towel and allow them to rest for 5 minutes. While the dough is resting, line a cookie sheet with parchment paper and set it aside. Using a floured wooden rolling pin, roll one of the pieces into a large rectangle, as thinly as you can. Drizzle some olive oil and evenly slather the top of the rectangle with pesto (a butter knife works, but your fingers are even better for spreading it on the dough). Evenly scatter chopped tomatoes and garlic over the pesto. Scatter a handful or two of grated cheeses. Roll the rectangle up as tightly as you can like a jelly roll to form a long tube. Use a sharp knife or the dough scraper to cut the tube in half lengthwise. Turn the pieces so the lines from the filling show. Form each piece into an S shape, pushing the ends underneath in the center. Make sure to keep the filling lines facing upward. Place the S onto a parchment covered cookie sheet. Repeat with other side of the tube. Cover with a clean tea towel followed by a large plastic bag and allow to rise at room temperature until doubled. Baking When the shaped loaves have doubled, turn the oven to 350F. Put them on the TOP rack of the oven to prevent them from burning on the bottom. Bake for about 30 minutes in total, turning them around once half way through to account for uneven oven heat. The bread is done when it is golden on top and sounds hollow on the bottom (around 200F inside). 1.) Water: Please do not use water from the hot water tap. Instead, heat the water in a kettle or microwave (to create lukewarm water, add cold water until it is the correct temperature – use the baby bottle test on the back of your wrist. Or… you can use a thermometer.) Please note that before the yeast is added, the water temperature must be BELOW 120F because yeast begins to die when the temperature is higher than 120F. 2.) Milk: The BBB recipe calls for warm milk. I was too lazy to heat up milk, so decided to use powdered milk instead. 3.) Sugar: I just couldn’t face putting sugar into the bread. So I left it out. I’m really glad. 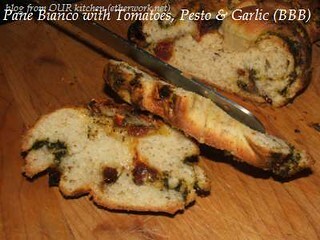 I think it would have made the bread cloyingly sweet with the basil, garlic and cheese. Now, if I were going to turn this into a dessert-like bread with dried fruit filling, I would add the sugar. 4.) Flour: The King Arthur recipe calls for Unbleached Bread Flour. Unbleached bread flour is almost impossible to find here so I used unbleached all-purpose and vital wheat gluten to up the gluten level. I used Susan’s (Wild Yeast) formula of adding roughly 3% vital wheat gluten to mimic bread flour. I also decided that the bread was just a little too “white bread” and substituted some of the all-purpose flour with whole wheat flour. And then at the last minute, I decided to throw in some ground flax seeds. Dianna Wara’s original recipe called for 5 to 5 1/2 cups of flour. We found that made a very sticky dough, and we surmise she may have used the dipping method to measure her flour, yielding a heavier cup of flour. By weighing out the equivalent of 6 cups of flour – 25 1/2 ounces – we came out with a dough of the correct consistency. 6.) Filling Measurements: It just didn’t make sense to me to measure very carefully for the filling ingredients. I eyeballed it. The amount I used seemed right. I wouldn’t have changed anything – except to make sure that the tomatoes were well buried in dough before putting the bread in the oven. 7.) But I LIKE warm bread! If you wish to serve warm bread, reheat it after the loaf has cooled completely. To reheat UNsliced bread, turn the oven to 400F for 5 minutes or so. Turn the oven OFF. Put the bread in the hot oven directly on a rack for ten minutes. If the bread happens to be is a little stale, put it into a paper bag first. Spray the bag liberally with water and place it in the hot oven until the bag is dry (about 10 minutes). 8.) Burned Tomatoes Any of the tomato pieces that were sitting close to the surface got badly charred. I suppose that I could have paid attention and put a hat over the bread to stop it from getting to dark, but I love the look of a dark gold crust. Bake […] in a preheated 350°F oven 35 to 40 minutes. Tent loaf with foil after 15 to 20 minutes to prevent overbrowning. I have tried many recipes and techniques. I have to admit, the ones that excite me most are the fun fillings and shapings. This bread was a winner in the National Festival of Breads for that reason – it’s fun and flavourful. It also goes great with cream cheese… just sayin’. The first loaves I did fairly close to the recipe, next ones I used pesto and roasted garlic with the sundried tomatoes. Next time I’m thinking of using olives, thyme and feta. What will your loaves be like? I can’t wait to see! We know that you too will WANT to bake this bread!! To receive a Baking Buddy Badge to display on your site: bake stuffed Pane Bianco in the next couple of weeks and post about it (we love to see how your bread turns out AND hear what you think about it – what you didn’t like and/or what you liked) before the 26 April 2013. If you do not have a blog, no problem; you can also post your picture(s) to Flickr (or any other photo sharing site) and record your thoughts about the bread there. Please remember to email the Kitchen of the Month to say that your post is up. Katie, Thyme for Cooking: Tomato, Basil, & Garlic filled Pane Bianco; Bread Baking Babes Stuff It! This entry was posted in baking, BBBabes, bread - yeasted & unyeasted, bread recipe, food & drink, posts with recipes on Tuesday, 16 April 2013 by ejm. My goodness and I thought I was radical the way I play around with ingredients … you really went on a wild streak! HaHa and got really glorious bread. Such wonderful flare you demonstrate with that slash thru sugar. I gave it a token of sugar. Just gorgeous and who can hate a bread with pesto and tomaotes? Wish mine had the oven spring yours did. Maybe leaving out the sugar did it..haha. Ha! You are a rebel, and a banana. I think it would surprise people how quiet and laid-back you are in person. Love your ideas for the loaves, these ones look great and I think some wine cooked mushrooms would be amazing too! Wow, this looks great! When I read “brioche reminiscent” in the end I was convinced that I will love it and have to give it a try sometime. Although you are right that after a long winter with its many cake-like delights there’s urgent need for more lean treats ;-). It was pretty glorious, Tanna, even though the crumb was softer than I expected. You’re right, Elle, who CAN hate a bread with pesto and tomaotes? I wish I knew what I did to make the oven spring so dramatic. I’m wondering if it was measuring the water temperature. Since I’ve been making sure that any liquid is 90F, bread has been turning out significantly better. Hahaha! I like that, Natashya! I AM a banana. (I can’t get over that people now think I’m so rigid and that I measure everything. Although… I do love measuring.) And yes, the wine deglazed mushrooms would be good in this bread, wouldn’t they? Remind me to try that! Yes, Barbara, I was really glad I eliminated the sugar. I think it would have ruined the bread. It just doesn’t make sense to me to add it. I can’t wait to hear how your bread turns out, Claudia and hope you try it soon.